You may have seen a growing number of Nokia Lumia adverts on your screens. The ones channel 5 have are a little different. These aren’t just ads. These are Channel’s own idents, filled with lumia – the part that shows the identity of the channel and also filling in to tell you what’s coming next. 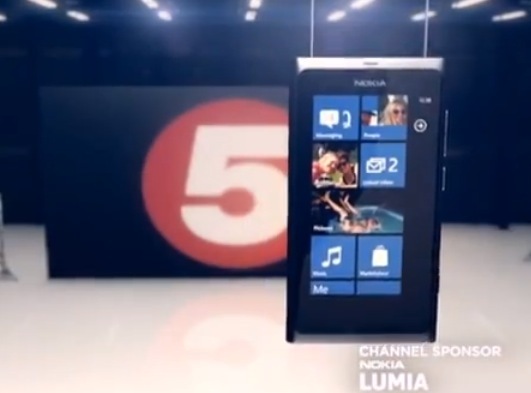 I’m loving what seems to be a very big shock and awe style campaign – an assault on the channel 5 readers as both TV and web is dominated by the imagery of the Nokia Lumia 800. The key is getting people to try out Nokia Windows Phone. That’s what CSS Insight’s Ben Wood says is the struggle for Nokia now. These are very important ice breakers. Whilst it would have been ideal to have both something supremely ahead in hardware (cpu/gpu specs, screen size/pixels, battery, camera) this is currently more than enough as it does offer an amazing user experience. From solid foundations, we can build stronger walls. Coloured tiles is becoming Nokia’s new identity now. If they can do it, any time HTC or Samsung does something with tiles, it feeds back on Nokia. Oh here’s some Nokia promos for the Lumia 800 – info bytes on getting to know WP.